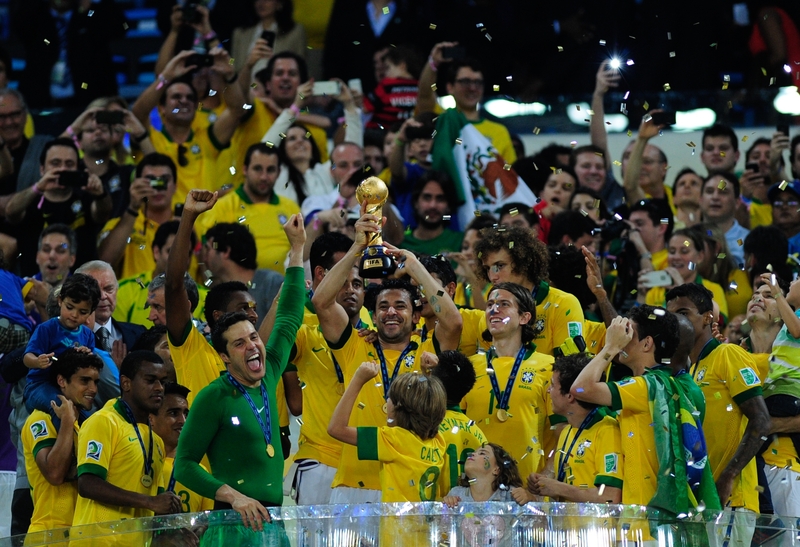 Holland avenged their World Cup finals defeat by thrashing the reigning champions in the second half. Diego Costa was deemed fit to feature in Vicente del Bosque’s 4-2-3-1 ahead of Andres Iniesta, Xavi, and David Silva. Xabi Alonso and Sergio Busquets played in the double-pivot. Louis van Gaal started Arjen Robben and Robin van Persie upfront in his 3-4-1-2 with Wesley Sneijder playing behind the duo. Jonathan de Guzman and Nigel de Jong formed a midfield two, while Daley Blind and Daryl Janmaat operated as wingbacks. Despite starting the match well, Spain failed to cope with Holland’s direct approach that involved the midfield quickly facilitating the ball to their strikers behind the Spanish defence. The most intriguing talking point subsequent to kickoff was Holland’s approach without the ball. Usually teams would opt to defend in two deep banks of four and force the Spaniards to break them down, but here, van Gaal’s men held an extremely high-line and pressed in midfield. Van Gaal aimed to pack central zones with hard-working players and limit as much space as possible for the Spaniards to work in. De Guzman and de Jong pressed Xavi and Xabi Alonso – who were both quiet – Sneijder worked hard to cut off Busquets’ passing lanes, and the surprising feat was the positioning of Stefan de Vrij and Bruno Martins Indi. The two outside centre-backs man-marked Iniesta and Silva when they drifted infield to receive the ball; sometimes all the way into Spain’s half. 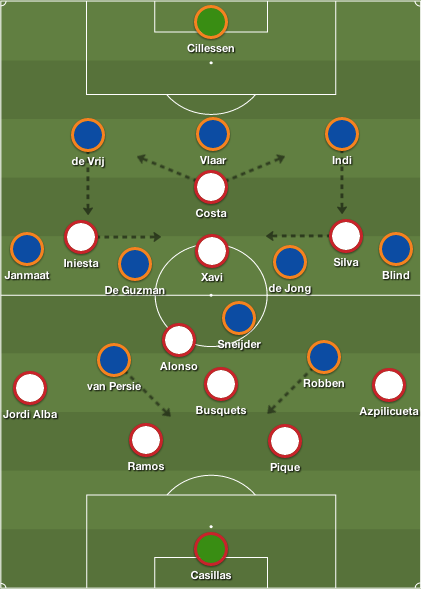 Iniesta and Silva were often fouled and they struggled to turn due to the committed defending of de Vrij and Indi. Likewise, neither Cesar Azpilicueta nor Jordi Alba got forward enough, as their was limited time in central areas to string passes out in these wide zones, while Janmaat and Blind closed the Spanish full-backs down. Holland’s intent was to clog spaces in central zones to prevent the Spaniards from overloading the midfield and dictating the tempo of the match. Spain, on the other hand, was more conservative out of possession, and didn’t rely on their high-pressing that has proved beneficial in recent years. 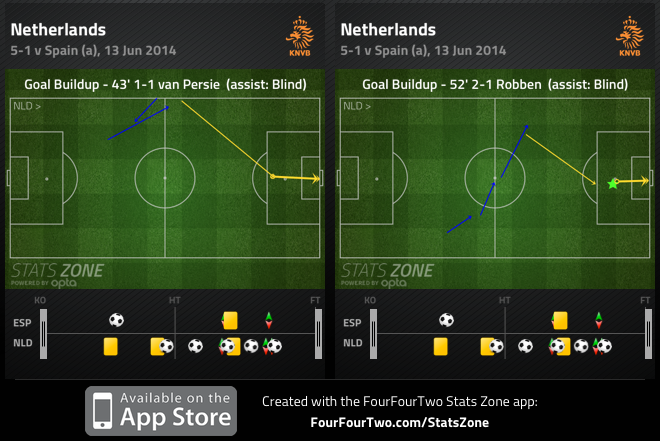 Spain dropped into two banks of four with Xavi behind Costa attempting to close down the Dutch defenders. The issue with Spain’s approach without the ball was that it lacked motivation and grit. At times, Holland easily shifted the ball from side to side, as the Spanish players failed to effectively close van Gaal’s men down. Silva and Iniesta also appeared disinterested in committing their defensive duties in wide areas, further allowing Holland’s wingbacks forward, while Robben and van Persie made runs into the channels. Spain’s work ethic out of possession was the vast difference between Holland’s approach as del Bosque’s men were sluggish and lacklustre. With both side’s opting to play with high-lines, the space to exploit was behind the defence. Spain, however, encountered two issues throughout the match. First, Spain didn’t offer runners in midfield, and the only player aiming to get behind the defence was Diego Costa. Costa made several intelligent runs behind Holland’s back-line, and he appeared frustrated when passes weren’t played into his path. Jordi Alba was the other player that could have offered this threat but Janmaat kept the left-back quiet. Silva’s movement into central areas left gaps of space available on the right, but Azpilicueta was quite cautious with his positioning. Pedro Rodriguez would serve as a useful option on the right flank, as would Juanfran who displayed his adventurous running when he exploited Eden Hazard in the Champions League this season; but it appeared that Azpilicueta was preferred based on his defensive qualities. Spain, however, did receive their opportunities when they occasionally bypassed Holland’s press, or the outside centre-backs were caught out of position. Xavi played two balls into Costa – one from deep and the other between the lines – but on both occasions the recovering Ron Vlaar broke up the play. Xavi’s third pass was the charm, and it occurred when the Dutch centre-backs didn’t come out to press Iniesta and Silva. The duo exchanged quick passes ahead of de Guzman and de Jong before sliding the ball into Xavi between the lines, and the Spaniard delivered an inch-perfect pass to Costa who was taken down and awarded a penalty. An identical situation occurred in the latter stages of the half with Iniesta dropping deep into midfield – away from de Vrij – and Silva drifted to the left channel to make an unmarked forward run to collect the Barcelona midfielder’s sumptuous no-look pass, but he failed to beat goalkeeper Jasper Cillessen with his delicate chip. The Spanish attacking three exploited space between the lines frequently in the second half, but they weren’t on the same wave-length with Costa – who didn’t appear 100 per-cent fit – and their final ball was often underwhelming. Spain struggled to play their preferred game due to Holland’s pressure, but with limited runners providing penetration, and the lack of conviction or a final ball in advanced areas, del Bosque’s men were bound to encounter issues. Van Gaal’s aligned his side to exploit the space behind Spain’s high-defensive line, and the warning signs were evident in the opening minutes. Alba’s poor chest pass in Spain’s half saw Robben slide the ball into Sneijder, but the Dutch midfielder fired his shot directly at Casillas. Robben and van Persie were both caught offside on a few occasions prior to the latter’s opening goal, yet del Bosque was unfazed by their threat. The other worry was the combination plays on the flanks subsequent to Alonso’s goal that led to de Guzman and Blind delivering quality crosses into the box that surprisingly evaded everyone. The work ethic from Iniesta and Silva in these defensive errors were poor and Holland’s forwards were keen on drifting wide to create overloads. Coincidentally, the buildup in Holland’s opening goals were identical, as Blind’s terrific long diagonals from the half-way line saw van Persie lose Ramos, and Robben sneak behind Pique to provide quality finishes. The quality of the finishing and deliveries were world-class, but the defending from the Spanish centre-backs was putrid. The two following goals were merely defensive errors – both by Casillas, while Azpilicueta deserves some blame for the third goal – but the final goal epitomized Holland’s attacking approach. Indi won the ball off Pedro and Sneijder quickly sprayed the loose ball into the path of Robben who outpaced Ramos before cutting back inside to grab his second goal of the night. While Spain didn’t field enough options to exploit the space behind the defence, van Gaal possessed two forwards capable of punishing any side in the world under these circumstances. There were evident flaws in Holland’s brave approach, but van Gaal’s decision to alter his preferred system reaped rewards. “If I played with three attackers, my wingers would have chased down the Spain backs too much, that would be a waste,” van Gaal said. 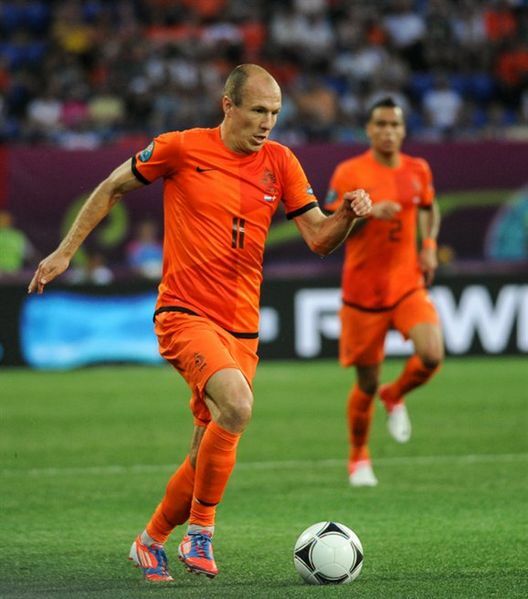 Van Gaal’s approach maximized the pace of Robben, and prevented Spain from dictating the tempo of the match in a congested area. Certainly if del Bosque introduced runners, or Silva converted his chance prior to van Persie’s equalizer the match could’ve been different. This serves as another crushing blow on Brazilian soil, yet the fact that it was preventable – del Bosque didn’t need to risk going 4-3-3, which created more gaps in midfield for Holland to penetrate on the counter – and could harm Spain’s chances of progressing out of the group. Van Gaal pragmatically built his approach towards nullifying and exploiting Spain’s strengths, whereas del Bosque’s belief in his players and reluctance to stray away from their philosophy led to their downfall in a match that could’ve gone either way. Lionel Messi’s first half hat trick was enough to guide Barcelona past Valencia, and remain top of the La Liga table. Gerardo ‘Tata’ Martino made two changes to the side that drew Atletico Madrid midweek, in the second leg of the Spanish Super Cup. Pedro Rodriguez joined Lionel Messi and Neymar to form the attack in Martino’s 4-3-3. Andres Iniesta also returned to the side replacing Xavi, to form a midfield three with Cesc Fabregas and Sergio Busquets. Miroslav Dukic made three changes to his starting lineup, after last week’s defeat to Espanyol. Sergio Canales and Dorlan Pabon joined Ever Banega in Valencia’s attacking three, replacing Jonas and Sofiane Feghouli. Andres Guardado started at left back in place of Jeremy Mathieu in Valencia’s back four, while Helder Postiga started as the lone striker. Despite Postiga’s late first half goals, Barcelona took advantage of the space between the lines and was the dominant side, creating several chances throughout the match. It’s normal for teams to drop off against Barcelona, based on their superiority in midfield, but what’s key is how you approach the match without the ball. Valencia took a naïve approach and chose to sit deep in a 4-5-1, as they chose to play a high-line. Now there’s no issue with the way Dukic aligned his men – the main issue was the lack of pressure applied to the Catalan side when they had the ball, and the amount of space between defenders. Valencia allowed Barcelona to play the match with freedom, and they punished Dukic’s men with three first half goals. One area that Barcelona got criticized for last season was their goal to keep a solid shape, opposed to pressing higher up the pitch when they lost the ball. Not only did it force Barcelona to defend for longer periods, but they also strayed away from a formula that was successful in the past. But the arrival of Martino has seen the Catalan side revert back to their defensive strategy, when the opposition has possession. They worked hard to close down Dukic’s men when they attempted to play from the back, forcing the home side to concede possession. It was successful in the first half, and it led to Messi’s second goal of the night. Valencia won possession and looked to play out of their half through Banega, but Busquets pressed the Argentine and won possession. 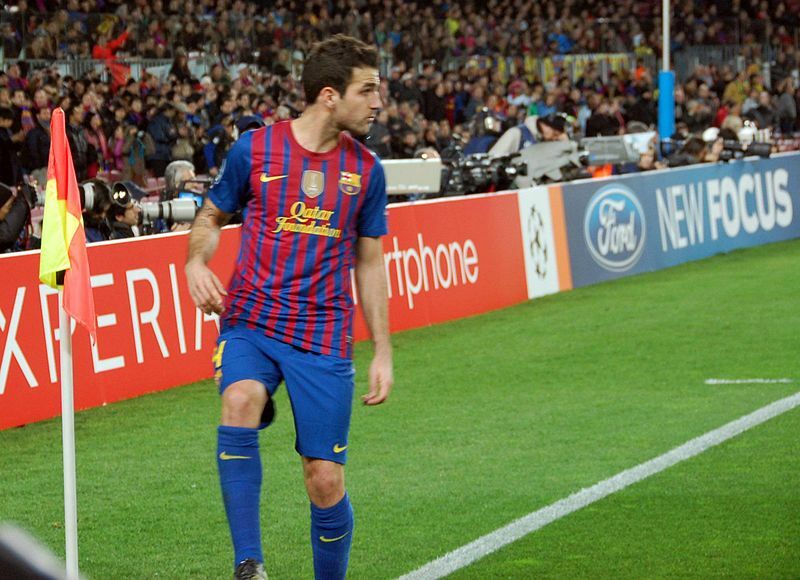 Fabregas picked up the ball and played a lovely pass to Messi, who calmly slotted his shot into the back of the net. Martino’s men worked hard to retain possession with their pressure, forcing Valencia to concede possession in their own half, presenting them with legitimate goal-scoring opportunities. 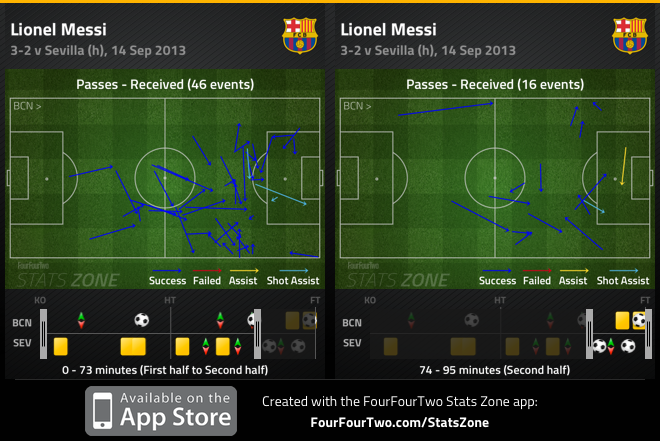 One clear aspect to Barcelona’s dominance was the amount of space available between the lines. Dukic’s men often changed their shape without the ball – they went from two banks of four, to a bank of five ahead of the back four, and despite being organized, they were not compact. Messi’s opener stemmed from the amount of space and time Fabregas received on the ball. Minutes prior to Messi’s goal, Fabregas played a defence splitting pass to Neymar, but the Brazilian was unable to make the most of the opportunity. Messi was different – despite being fortunate, the Argentine made an identical run behind the defence, but he got the ball past the keeper and tapped it into the open net. But it wasn’t only Fabregas enjoying the abundance of space available, Messi also dropped deeper, and the Barcelona forward had a significant impact in the Catalan side’s dominance. Messi found pockets of space throughout the Valencia half and was combining with his teammates, spreading passes wide, and aiming to thread that decisive ball in the final third. It was no surprise that Messi and Fabregas connected for Messi’s third goal – based on their dominance in the opening 40 minutes, it was just a matter of time. Messi dropped into midfield to receive the ball and he found Fabregas unmarked between the lines, waiting to receive the ball. Messi played in Fabregas, who then found Neymar out on the left – Neymar found an oncoming Messi who slotted the ball into the net. The third goal highlighted the amount of freedom Barcelona was given when in possession, and Martino’s men deserved their three-goal lead. The often-maligned Portuguese striker was signed by Valencia to replace Roberto Soldado, who made a move to Tottenham over the summer. Surprisingly, for all the negative reviews the Portuguese international gathers, he’s still managed to find the back of the net. 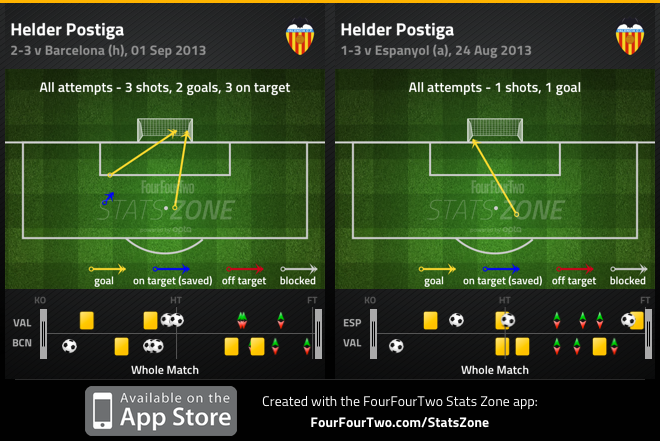 And in the span of five minutes, Postiga pegged his side back into the match with two quality finishes. Postiga provided an exquisite finish for his first goal, as Joao Pereira got into an advanced position on the right flank, and provided an outstanding cross for his countrymen. Minutes later, Postiga narrowed the lead to one, when the Portuguese striker made an intelligent near post run and flicked the ball into the far post. Postiga’s goals provided moments of brilliance, which allowed Valencia back in the game, despite their shambolic performance in the first half. Valencia got into dangerous positions in the final third, when they took advantage of the space provided in wide areas. In the first half, Joao Pereira was allowed to push forward at will, with Neymar not instructed to track the Portuguese fullback, when he surged forward. Iniesta drifted over occasionally to nullify Pereira’s threat, and Mascherano was forced to on a few occasions as well – this didn’t bode well for Martino’s men as Postiga was then able to drop off and link play with Mascherano out of position. Pereira’s freedom out wide led to Postiga’s opener, and it was an element to their attack that was successful in the opening 45 minutes. Dukic’s men took their focus to the opposite flank in the second half, looking to overload Dani Alves. In fairness, if Barcelona continued their high pressing that was so successful in the first half, this may not be an issue, but the Catalan side chose to get back into shape without the ball. When Barcelona lost possession, Banega and Pabon attacked the space behind Alves, creating a few opportunities. Banega and Pabon overloaded the left flank when Barcelona got into their shape, delivering dangerous balls into the box, but Valencia failed to find an equalizer. Barcelona was exceptional in the opening 40 minutes, and although they missed several chances to put the game out of reach, the rapid decline in their intensity, allowed Valencia back into the match. Valencia drops their second match in a row, conceding six goals in total, which is not impressive. Dukic’s men were fortunate not to lose by higher tally, based on how open they were throughout the match. With the Europa League about to kick off, it’ll be interesting to see how Valencia copes, but there are a few warning signs that are clearly being shown. The one positive is that Postiga has yet to look a downgrade to Soldado, and they’ll need the Portuguese striker firing if they intend on claiming a European spot this season. Barcelona keeps their perfect record intact, and they may not have an easier away outing this season. More importantly, the front three are beginning to click and Neymar is slowly finding his groove in La Liga. The one worry for Martino besides signing a centre-back, will be the approach he adopts, once his men are unable to press higher up the pitch, as Barcelona look quite vulnerable when sitting off and keeping their shape. Nevertheless, Messi continued to display why he’s the best player on the planet, while Fabregas has given Martino belief that he can afford to rest Xavi. Sunday night I decided to tune into the WWE Royal Rumble for nostalgic purposes. Growing up I was a big wrestling fan, but now I prefer to watch the Road to WrestleMania, because WrestleMania is equivalent to a Champions League final. The Pay Per View overall was quite poor and the main event saw The Rock defeat CM Punk in his first match in 9 months. May I remind you that CM Punk held the title for 434 days, and the manner in which he lost the title was an absolute farce. Moving forward, what caught my eye was the traditional, “30 Man over the Top Rope” Royal Rumble match. This is where I realized the WWE and The Barclays Premier League have a lot in common. I mean the final five men in the match were predictable and there were only two possible winners, Ryback or John Cena. These two were the only men in the match who had a chance of main eventing WrestleMania, as the other wrestlers are substandard to them. It’s similar to our modern day Premier League that from opening day had only two legitimate title contenders in Manchester United and Manchester City. The Premier League is the most watched soccer league in the world with arguably the largest fan base. The league gets more popular as time passes with the help of TV deals and an influx of foreign talent choosing to play their trade in England. I mean the Premier League has to be the best league in the world right? When was the last time you saw a title race go down to the final whistle? Who won the 2012 Champions League in Munich? The BPL has to be the best considering the “white Pele” plays there opposed to leagues that consists of two horse races or a league like the Serie A, in which Juventus is a class above the rest – hyperbole. When you think of Manchester United, Sir Alex Ferguson, history and trophies come to mind. United is the most successful team in the Premier League era winning 12 Premier League titles, including a treble winning season in 1999. Last season they conceded the title to their noisy neighbours on the final day of the season via goal difference. A 94th minute Sergio Aguero winner had denied United from claiming their 20th league title. It was a trophyless season, which saw them crash out of the group stage of the Champions league and get played off the park by Atletico Bilbao in the Europa League. In any sport, the aim is to get better and fix the flaws that you possess. When you’re a team like Manchester United, a trophyless season is unacceptable. United, like many Premier League teams, had various issues to address over the summer if they wanted to be legitimate contenders not only domestically but also in Europe. But on Friday August 17th 2012, they showed their domestic title aspirations as they acquired Robin Van Persie for £24m from Arsenal. Many questioned the signing, as Ferguson ignored two key areas he needed to address. However, we’re half way through the campaign and as the days go by it looks like Ferguson made the right decision. Van Persie has netted 22 times this season and is arguably the reason why United, with a game in hand, are four points clear at the top of the Premier League. The Dutch striker scored 36 goals last season for Arsenal is also a key factor in United’s FA Cup and Champions League run. United have made their best start to a season since the three point rule was introduced, obtaining 55 points from 66 in the opening 22 games. It’s a remarkable stat and if they were to continue picking up 2.5 points a game they would match the 95-point record set by Chelsea in 2004-2005. Theoretically to win a soccer match you need to outscore your opponent, which is what United are doing. Although they have major weaknesses, their luxury in attack has covered up their flaws. Javier Hernandez, Robin Van Persie, Wayne Rooney and Danny Welbeck have scored approximately 62% of United’s goals in all competitions and 60% of their goals in the Premier League. Also, with Patrice Evra and Jonny Evans having their best goal scoring seasons, United have scored a league high 57 goals. Despite their fantastic start to the season, if United reclaim the Premier League title, they’ll do so with the worst defensive record in the last decade. The most goals conceded by a champion over the last decade were 37(Manchester United 2010-2011) and United have already allowed 30. This season United has given up several goals from set pieces, and have been exposed when teams take the game to them. In fullbacks Rafael and Patrice Evra, they have great options going forward but defensively they’re good, but not reliable. David De Gea has had a few shaky moments this season; he’s a great shot stopper that lacks a physical presence but will only get better with experience. In terms of centre backs Evans and Rio Ferdinand have been efficient, and are at their best when United sit deeper. With Chris Smalling and Phil Jones they have young English talent that have potential to be top Premier League defenders in the future. Lastly captain Nemanja Vidic is a massive boost when in the line up, but there are concerns in whether he’ll ever recover his best form. In the midfield you have deep lying players in Michael Carrick (whose been fantastic this season) and Paul Scholes who like to control the tempo of the game, but also struggle when pressure is applied to them. In Anderson and Darren Fletcher you have runners who provide energy in the midfield but both struggle to stay fit. Then you have Tom Cleverley, who is by far United’s most technical midfielder. Cleverley is a very versatile midfielder that tends to play higher up the pitch and is direct when United have possession. What United lack in their midfield is a physical presence – a box-to-box midfielder. United struggle to take control of games and against sides that possess highly technical and physical players in the midfield, they lose control of the game and get overrun. Juventus has Pirlo, Marchisio and Vidal, Barcelona has Busquets, Xavi, Iniesta and Fabregas, Real Madrid can rely on Khedira, Alonso and Modric, and Bayern Munich has Martinez, Schweinsteiger , Kroos and Gustavo at their disposal. There’s a gulf in class in the midfield between world football’s elite and England best and that is quite alarming. The question most will ask is with defensive frailties at the back and the lack of a dominant box-box midfielder, how are United still at the top of the Premier League? Well that’s down to the decline of quality teams in the Premier League over the last two seasons. The Premier League is filled with many inferior sides when matched up to the clubs from Manchester, which explains why they succeed despite possessing major blemishes. Neither side has a tactical identity, but they have an abundance of attacking players, and a few world-class players. Their ability to outscore several inferior sides is the answer domestically, but has been their downfall in Europe. The WWE has gone from the likes of Stone Cold Steve Austin, Undertaker, Triple H, Brock Lesnar, Chris Benoit, The Rock, and Kurt Angle to John Cena, CM Punk and Sheamus. Once upon a time Liverpool, Chelsea, and Arsenal were elite European sides that also made the Premier League competitive. Now there’s a distinct gulf in class between the two clubs from Manchester and the rest of the so-called top Premier League sides, as there is with the top stars in the WWE. Since the recent decline in the Premier League, Manchester United has made it past the Champions League semi-finals once, in which they were outclassed by Barcelona at Wembley. That year they faced Marseille, Chelsea and Schalke 04 to make it to the finals, teams that are good, but not great. The year prior they were knocked out by Bayern Munich and last season they failed to get out of the group stage, and were played off the park by Atletico Bilbao in the Europa League. It’s not only Manchester United, but the other top English sides have failed to make a mark in Europe, other than Chelsea’s fortuitous Champions League victory last season. Prior to that they were knocked out of the round of 16 by Inter Milan, the quarterfinals by Manchester United, and the group stage this season. Frankly, one can argue that United’s success this season isn’t due to how good they’ve been but is simply an indictment on the league as a whole. But it leaves us to ask one question, why hasn’t Ferguson attempted to fix these issues? It looked like he was keen on doing so after being humiliated at Wembley, but it’s possible he felt his side would be able to bounce back from that. Half way through last season Paul Scholes came out of retirement as a short-term option to bandage the issue. He did a great job, but United falling short to City has made Fergie determined to reclaim the Premier League title, and has once again overshadowed the problem. The signing of Robin Van Persie was the answer to his problem, and thus far it’s been a success domestically. With a Champions League tie against Real Madrid looming, we’ll get to see how United fare against an elite side. The WWE in general has a handful of elite stars and through watching the Royal Rumble Sunday night, I’ve come to a conclusion that like the WWE, The Premier League and Manchester United have suffered a major decline in terms of quality. Nevertheless, in terms of points total, this can be the greatest Manchester United side in the Premier League era. With some saying, we’ve yet to see the best from United this season, it’s possible that this might be as good as they get. Its time to accept what United are, and what the Premier League has become. United is not an elite side and The Premier League is not the best league in the world. Furthermore, United is a good side that has possibly created a new cliché in modern day football. That being, offense wins championships, in the Premier League.